"The right kind of schedule is merely a guide to getting things done without crowding too much into any one day. 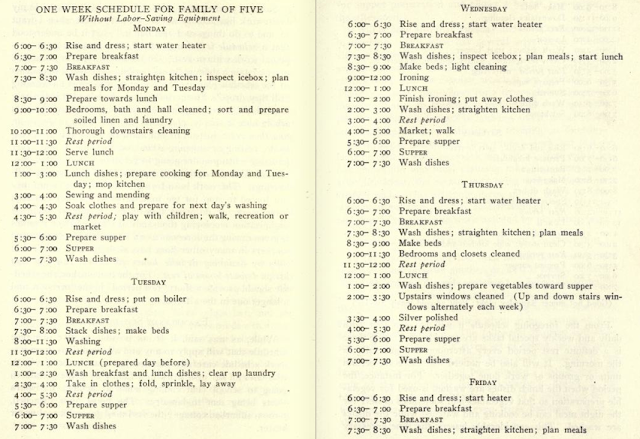 The daily jobs of meal preparation, getting children off to school and a general straightening up of the house are governed by the routine of the family and cannot be altered. 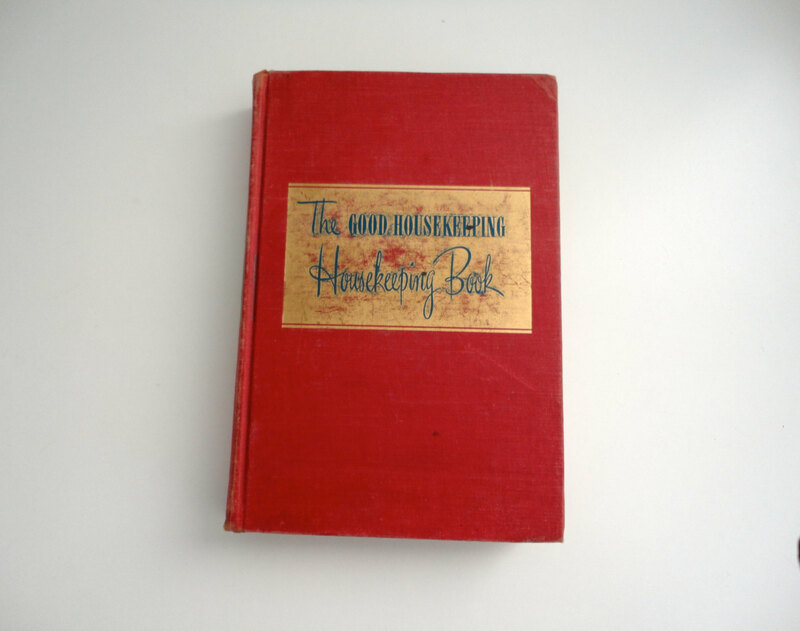 It is the time-consuming work such as through cleaning of living room, bathroom, etc., and washing and ironing, which must be spread out over the week and fitted into a plan" (Good Housekeeping, pp. 242). According to the National Association of Home Builders in 1950s the average size house was 983 sq ft., and according to the U.S. census bureau the average size of a new home peaked at 2,521 square feet in 2007. That's a huge difference of area to clean - no wonder I can keep up! 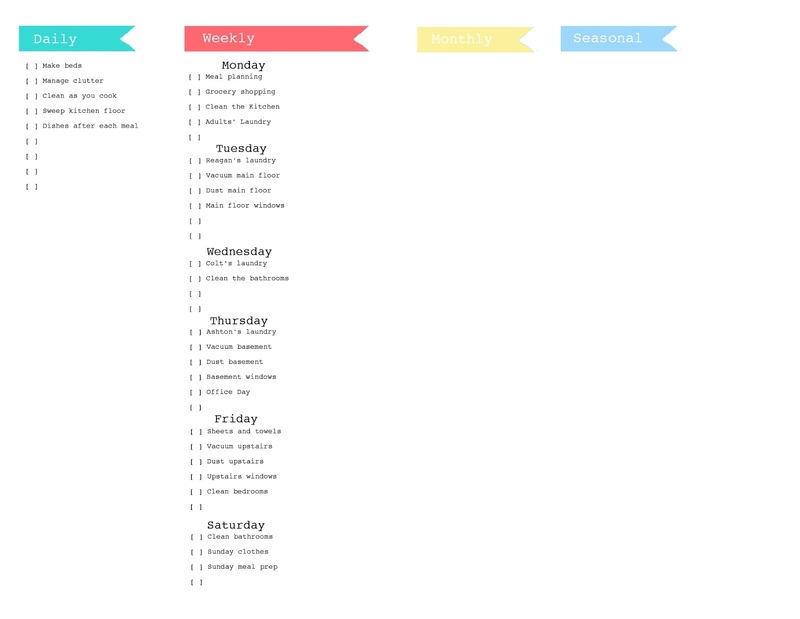 Well no more excuses - I've created a schedule based off of my three housekeeping books. According to them having a plan makes sure all the household tasks get done each day, week or month. It also helps to avoid a huge back-up of work when unexpected events come up because a plan allows the homemaker to determine what tasks need to be done on priority and which can wait. Household Engineering says that "the order of work is by far the most important, and the thing that must be determined first. The reason for so much "nerves" and useless effort is solely to be found in the lack of order in the work-plan" (pp. 66). So first is to determine the order of the work, the daily, weekly, monthly and seasonal tasks - phew, I'm tired already. Let's start with the daily and weekly tasks for now. Make the bed - right when you get up, kids too. Manage clutter -as you leave a room pick up the things that don't belong and put it where it does. Through cleaning of each room - dusting, vacuuming, mopping etc. According to my housekeeping books it was once traditional to do laundry on Monday, however both my 1920 and my 1947 books say to bag this tradition and move laundry day to Tuesday and Thursday. Martha Stewart says that because I'm on a septic system I will want to do a little bit of laundry each day so as not to overload my tank with 10 loads worth of water in one day. So I plan on assigning each bedroom a laundry day and then one for bedding and towels together, that way as the kids are able to do their own laundry they will be used to having an assigned day. Because I have to drive my kids into school and pick them up (at 4 different times) I like to do my main cleaning in the afternoons, it just works out best that way. Household Engineering says that I should try one plan and then continue to modify it until I find the most efficient method in execution. Truly an experiment I guess. Here is experiment A - my first schedule in CSH. Monday - Put the household back in order from the week-end break. Plan meals, grocery shop, clean vegetables and fruits and put them away for the week use. This is also the day to clean the kitchen thoroughly. Tuesday- Master Bedroom Laundry day. Dust, clean windows, vacuum and mop the main floor. Wednesday - Thorough cleaning of bathrooms. C and R's laundry day. Thursday - Dust, clean windows, and vacuum the basement. Office day, pay bills etc. A's Laundry day. Friday - Bedding and Towels laundry day. Thorough cleaning of Bedrooms. Vacuum and dust the upstairs. Saturday - Thorough cleaning of Bathrooms. Any special preparations for Sunday, church clothes, baking, dinner prep, or if there is something needed for family get togethers etc. As I do each day's cleaning I will share how the history books recommend I do it. I'll give this schedule a week and then start adding in the monthly and seasonal tasks too. Everything starts Monday- wish me luck, I think I'll need it.